A sweet family hurries through the snow to the neighbor's Christmas party. He carries a gift for their friends, and the entire family is bundled for the walk in the snowy weather. When you switch on the light inside the lamp, the snow sparkles on the bottle brush trees and the home in the background. 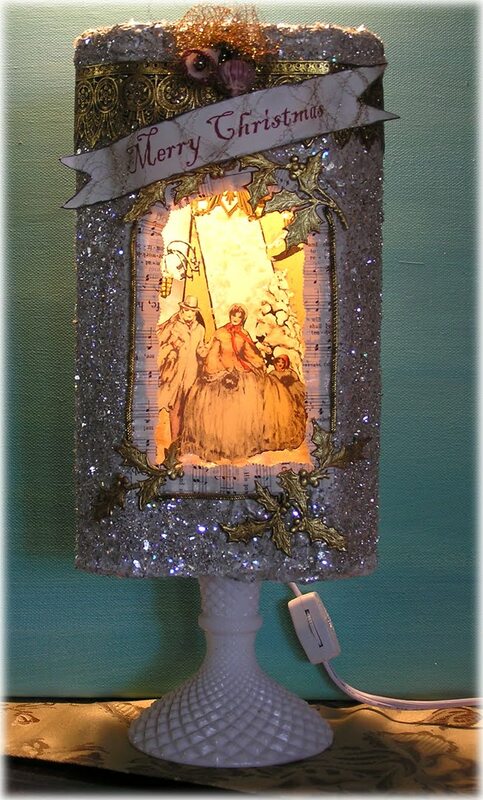 Here is the lamp when it is lit. I've covered the piece with my Christmas glitter mix and adorned the outside with gold dresden trim, gold bullion, metallic tulle, music paper and a small vintage Christmas bell and ornament. This one-of-a-kind lamp stands 13 inches tall and about 5-1/2 wide. The base is vintage white glass. All is firmly secured. Signed and dated. 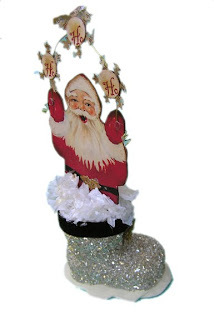 A beautiful piece for any collector of vintage holiday work. Please click on the photos for a larger view. Similar to a candle, I recommend you do not leave the lamp unattended while lit. Email me to purchase, iva@ivascreations.com. 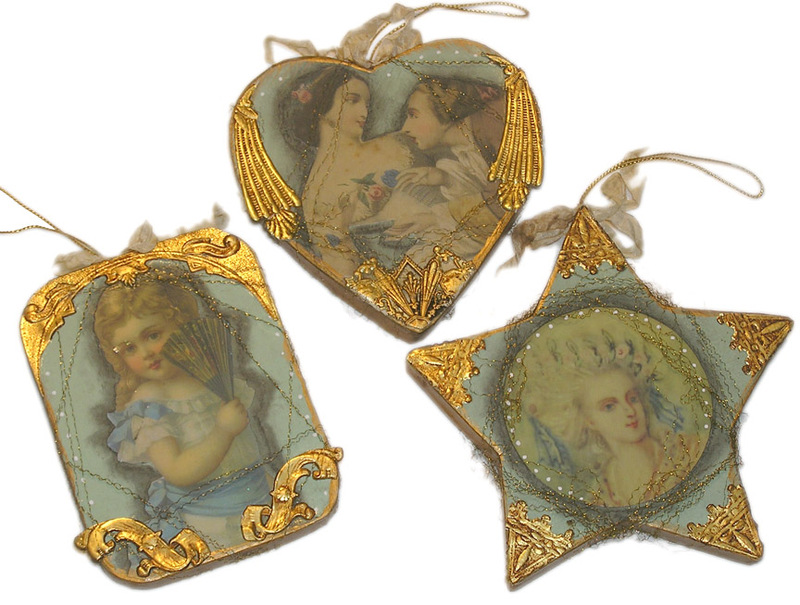 Gold and silver dresden birds float among the trees with sweet little cherubs. Each is made of chartreuse mettalic crepe paper, real silver tinsel and a reproduction vintage image. I've given each a gold twisted wire loop for easy hanging on the tree and a small saying. Click on the photo for a larger view. Each is about 4-1/2 inches tall and signed and dated on the back. Please indicate which ornament you'd like using the corresponding number next to each. 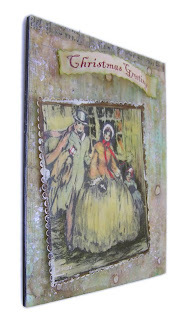 I fell in love with this image of a Victorian family and immediately knew that it would make a lovely mixed media collage. I've painted the sheet music background with subtle teals, creams and pinks. 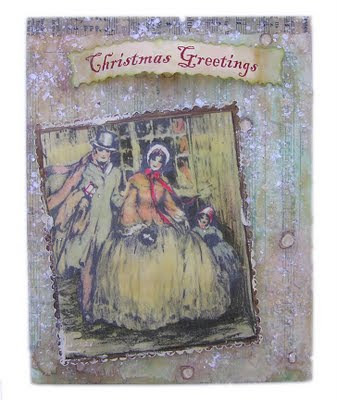 I've added small hand drawn circles and painted them with cream to look like snow. I've coated the piece with 100 percent natural beeswax and then sprinkled mica flakes over it. It really sparkles like snow! The family is also coated in beeswax and are raised above the background. It is on 1/4-inch pressed wood board that measures 8x10 inches. A sawtooth hook is in back making it ready to hang. One of a kind and comes signed and dated by me. Please click on each photo for a closer view. 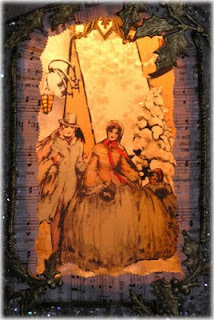 Two adorable children and their sled laden with a small Christmas tree are the focal point of this mixed media collage. The base is an antique photo cabinet card, which I've stamped with gold swirls. 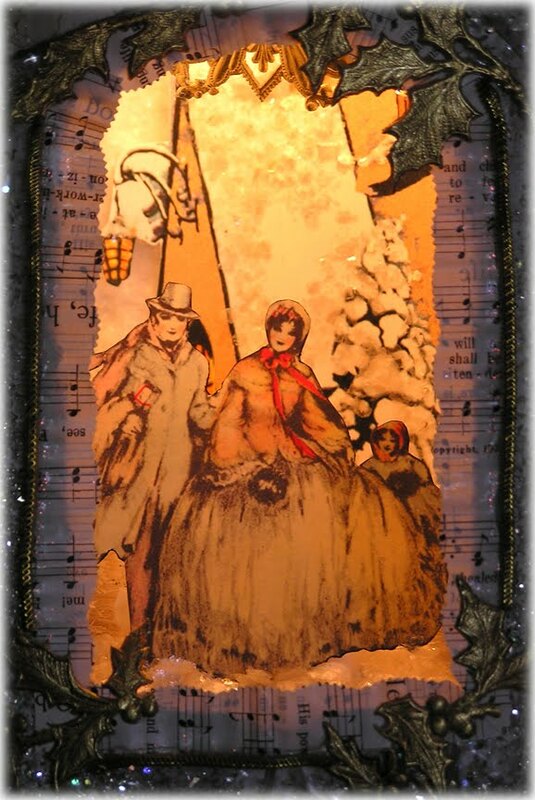 Creamy sheet music backs the reproduced vintage image of the pair. 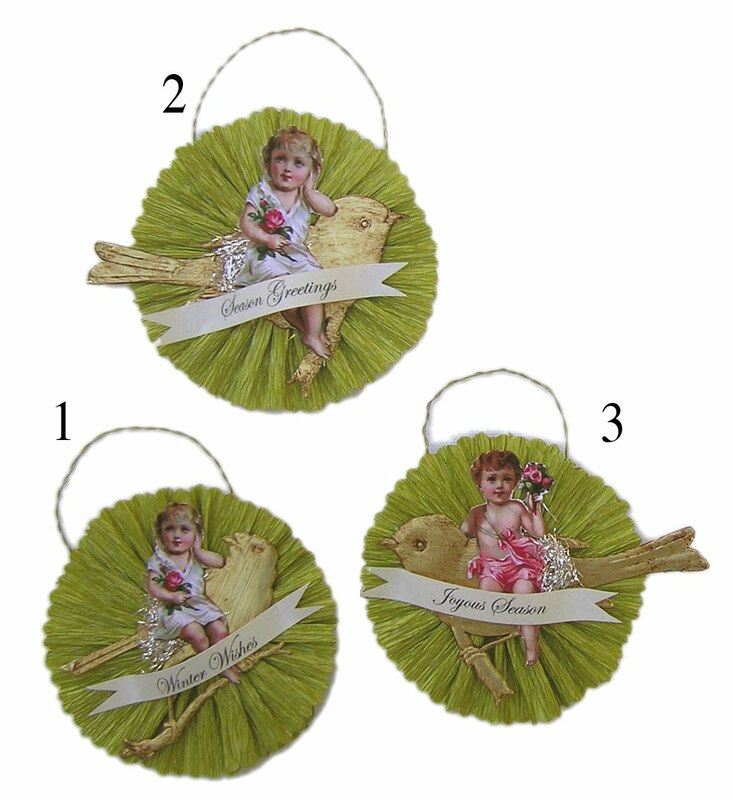 Each has a set of gold dresden wings. 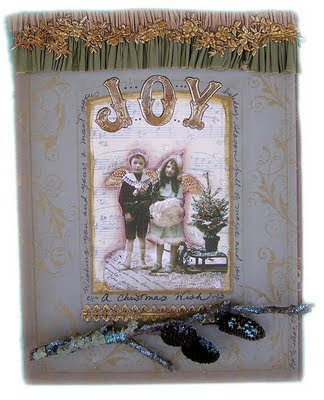 At the top, I've added vintage crepe paper and a beautiful dresden floral swag. I've incorporated my love of nature by adding an oak branch and tiny pincones all sprinkled with iridescent glittery snow. Around the perimeter of the photo, I've hand written, "A Christmas Wish ~ Wishing you and yours a most joyous holiday season full of magic and joy!" A small wire loop in back makes it easy to display this original piece on a wall or stand in an easel. Signed and dated. Click on the photo for a larger view. Using vintage images from my collection of Victorian scrapbooks, I've reproduced each and applied the old art of decoupage on paper mache ornaments. Each has been painted a beautiful teal and then given a nice aged affect. 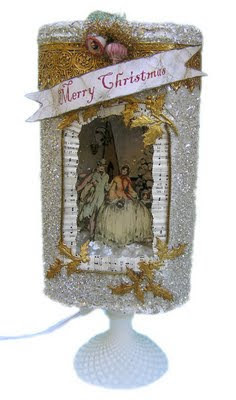 I've wrapped them with real gold bullion and then adorned them with old-fashioned gold Dresden. Each is unique and one of a kind! Please indicate which ornament you'd like based on the shapes, rectangular, star or heart. For a close-up view, click on the photo above. 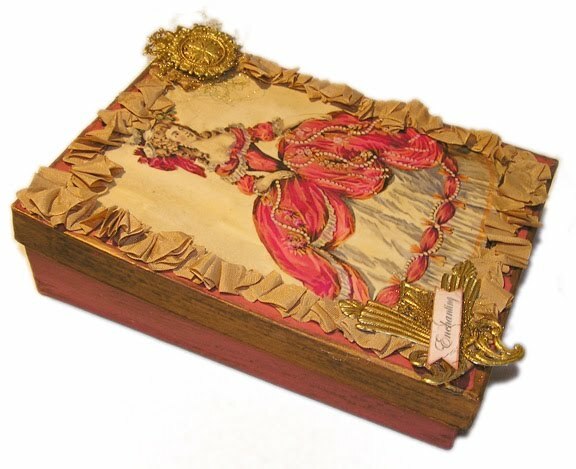 I love antique fashion plates and applied this one to a large paper mache keepsake box measuring 8 inches by 6 inches and painted dark pink with gold accent. The beautiful lady in a pink dress is surrounded by vintage seam binding with Dresden and gold bullion accents. The word, "Enchanting" is placed on the bottom left of the box. 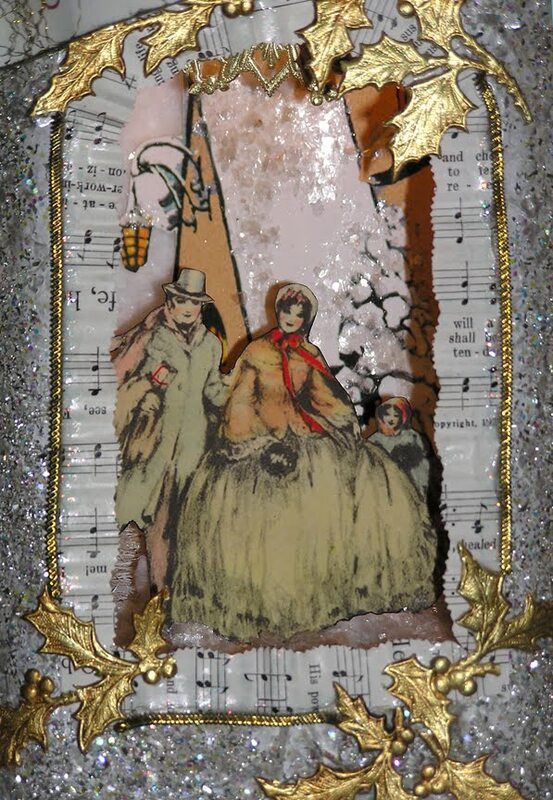 Inside, I've decoupaged an image of a castle surrounded by more gold Dresden. Click on the photos for a closer view. I've created a whimsical Santa popping in to say "Ho, Ho, Ho!" He sits in a silver glass glittered boot trimmed in black velvet ribbon, with a gold bullion button and stuffed with white crepe paper and mica flakes. 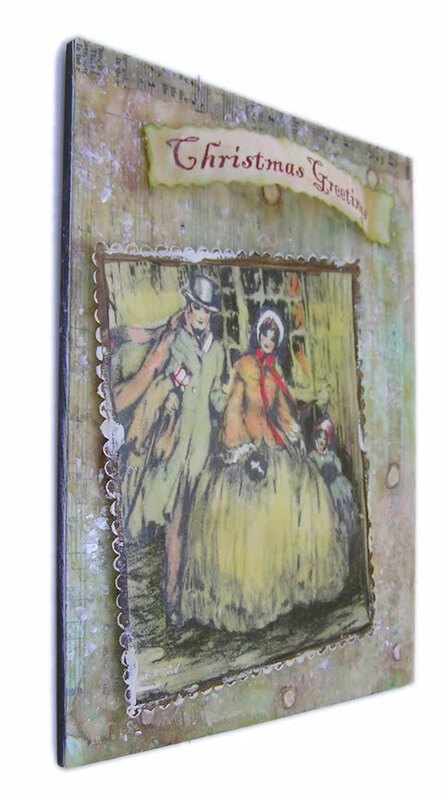 He is double-sided and a reproduced vintage image from my collection. I've attached gold wire to his mittens and the words are sprinkled across the wire and backed by snowflakes. He stands a little over 6 inches tall. Signed and dated by me. Click on the photos for a larger view. Beautiful gold and robin's egg blue highlight this elegant shoe fit for a queen! 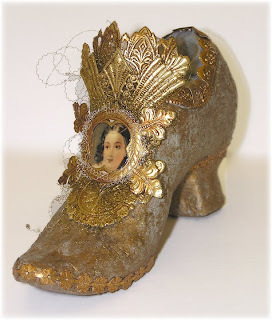 Using a vintage chocolate mold, I've created a paper mache shoe and adorned it with gold dresden trim, gold bullion, and a lovely blue silk fabric inside. 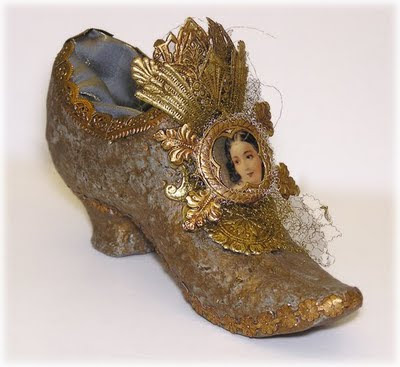 I've added the reproduced image of the queen to be on the shoe's medallion. Real silver crinkle wire also surrounds her. 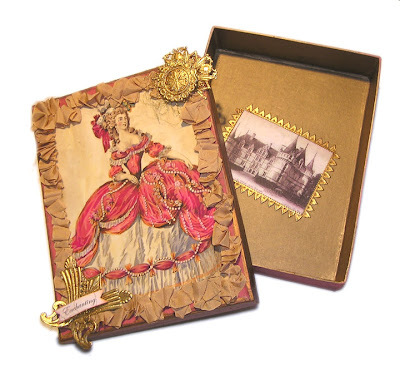 A one of a kind keepsake for those who love elegance and the era of Marie Antoinette. Signed and dated. Please click on the photo for a larger view. 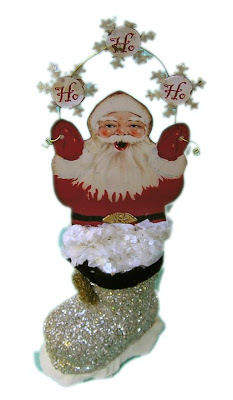 I thank you for stopping by my Holiday Web Show. I hope you have a wonderful Thanksgiving!